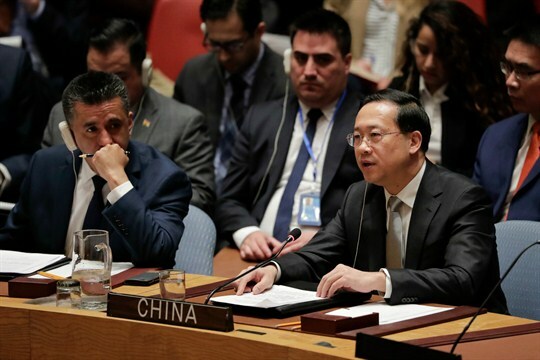 China’s ambassador to the United Nations, Ma Zhaoxu, speaks during a Security Council meeting at United Nations headquarters, New York, April 13, 2018 (AP photo by Julie Jacobson). The 105 cruise missiles that the United States, France and the United Kingdom fired at Syria late last week, in response to another suspected chemical weapons attack by President Bashar al-Assad’s forces, deepened the divide between Western powers and Russia over how to approach the next stage of Syria’s war. But amid divisions playing out both at the United Nations and on the ground in Syria, China sits in a precarious and uniquely advantageous position. As an actor that strictly denounces the use of chemical weapons and upholds the principle of nonintervention, Beijing condemned both the chemical attack outside Damascus and the U.S.-led punitive airstrikes that followed.